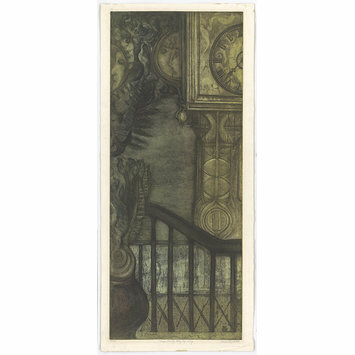 Etching and aquatint of a interior setting. There is a pot plant cropped on the left; behind are some railings. There is a grandathers clock in the background, cropped on the right. Handwritten in pencil, below the print. 'Time being Day by Day, etching and aquatint by Vera Berdich, USA, 1952.